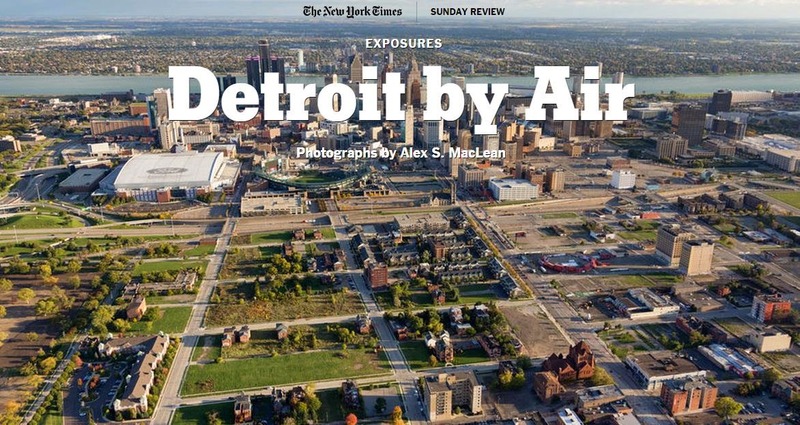 I first photographed Detroit from the air during the Reagan-Carter campaign 34 years ago. Housing abandonment was well underway. The city had lost tens of thousands of manufacturing jobs as the auto industry contracted and moved parts of its operations out of Detroit. “White flight” from the city, exacerbated by race riots in 1967, also contributed to severe depopulation of the area. Meanwhile, the construction of highways allowed people to live farther away and commute to work, perpetuating the exodus to the suburbs. When I photographed the city in 2004, Detroit was still in decline. I could see from a plane even more abandoned and burned-out buildings, rubble and foundations poking out above the ground. The situation only worsened with the 2008 recession. From the air today, the decline appears to be slowing. The spaces once covered in rubble are cleared and mowed. Open green spaces, along with new community gardens and orchards, look almost bucolic against the downtown skyline. From my plane, I sense the potential for resurgence in these areas. I can see how neighborhoods could become more walkable and support mixed-use development, with new shops, public transit and nearby parks and schools. However, this resurgence relies on a city that is stumbling out of bankruptcy. It also depends on an agency with the authority to consolidate abandoned lots for development and open spaces. I think that the inner ring of Detroit will win out in the long run, as cities are and will continue to be the greenest places to live on a per-capita basis. This is made only more striking when I fly over the suburbs and see the inefficiency of single-family homes. They are dependent on cars, for one thing, and are connected by miles of paved roads to single-use zones of office and retail developments. These areas will not fare well, if we begin to mitigate climate change through measures like a carbon tax. Detroit’s rebound is just a matter of time. Someday, I believe, it will be comparable to the once rundown sections of New York, Boston, Minneapolis and San Francisco, cities that are now thriving.